Jeremy Randall has been working in clay and making handbuilt earthenware pottery for over 20 years. He received his B.F.A. from Syracuse University and his M.F.A. 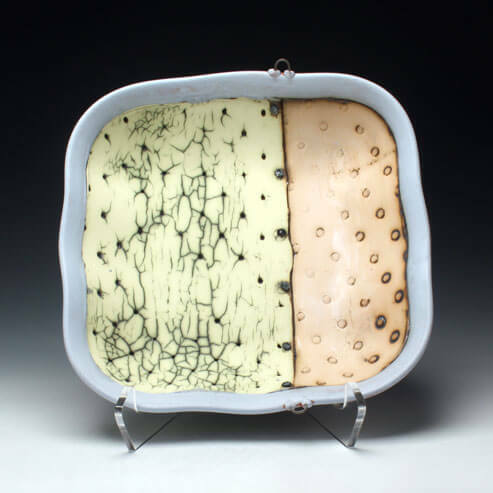 in ceramics from the University of Florida, and currently lives in Tully, New York, where he owns and operates his studio/teaching business Rusty Wheel Pottery. Jeremy’s work can be found in over 20 galleries across the US including the Clay Studio in Philadelphia, Red Lodge Clay Center in Red lodge, Montana, The Society of Arts and Crafts in Boston, Left Bank Gallery, CapeCod, and has shown in numerous national shows including the Philadelphia Museum Show, American Craft Council Baltimore show, The Washington Fine Craft Show, Strictly Functional Pottery National, and others. He has work in a number of public and private collections, and has been published in national and international periodicals, texts, and publications. He has also had the privilege to teach at studios, colleges and institutions across the US including Arrowmont School of Arts and Crafts, Penland, SnowFarm, Truro Center for the Arts at Castle Hill, Morean Center for Clay in Saint Petersburg, FL; and the National Council on the Education of the Ceramic Arts (NCECA) conference in Providence RI. In 2017 he began an apprenticeship program in his studio, looking for ways to offer traditional/non-traditional education experiences in a ceramic studio setting. Familiarity evokes memory and I look to this association to present nostalgia through form. My reference to rural American architecture and antique rural implements places the viewer in a familiar setting which is layered with time, function and history while color creates celebration in these iconic objects. The vessel forms tie these objects back to the domestic space, enriching ones living environment while allowing for quiet contemplation and a reminder of a simpler time.